From the author of Cracked Up to Be and Some Girls Are comes a gripping story about one girl’s search for clues into the mysterious death of her father. Courtney Summers is one of those authors I come to for a really depressing read, and she really delivers in Fall for Anything. Eddie Reeves’ has not been the same since her photographer father committed suicide. Of course, who would be with a loved parent dead and no idea why he would do such a thing? Fall for Anything is a girl’s search for answers. In the wake of her father’s suicide, Eddie’s mother has fallen apart, refusing to leave the house or take off her husband’s housecoat. A nosy friend of the family, Beth, moves in to keep the family functioning the way she thinks they should be. Eddie does not approve. I really like how up front Eddie is about her distaste for this person coming and messing with their mourning. The moments when she complains about Beth or about her best friend Milo’s girlfriend are when she feels most like a normal teenager. Seth Reeves hardly left anything behind to explain why he killed himself. Until she knows why, Eddie doesn’t know how to deal. To cope, she turns her focus to frustrating Beth and thinking about boys. She’s looking for meaning, and if she can’t find it in her father’s action, maybe she can find it in Culler Evans, his only student. Eddie makes some really dumb choices with regards to romance, but they’re so obviously a cry for help even she doesn’t know she’s making. My favorite part is the mystery of why Seth jumped from the roof. Eddie and Culler find a box of photographs. From them, they discern clues as to his reason for exiting this world. Their search turns into a road trip and a bunch of life lessons. Those left behind when a loved one commits suicide will always wonder why, and feel culpable; this is why Eddie searches. One of the most fascinating techniques Summers uses to highlight Eddie’s discomfort is the coldness in her hands. Since his death, her hands have not been warm, even though it’s the middle of summer. She has trouble using them and it’s almost as though they’ve been damaged by the ordeal and cannot be fixed, in much the way Lady Macbeth couldn’t get the damn spot out. Unfortunately, I never personally connected with Eddie, and I viewed her solely from a distance. My heart didn’t ache for her the way it did for Sloane in This Is Not a Test. Both are withdrawn, unhappy, messed up girls, but for some reason Sloane captured my heart and Eddie did not. I think part of my disconnection was how incredibly sad every aspect of this book is. I prefer a bit more humor, even really dark humor, mixed in to lighten the mood. That juxtaposition tends to make points more strongly, I find, than a book that stays consistently sad. Courtney Summers writes amazing books, though I do not think this one will be my favorite of the bunch. I do, however, plan to revisit this one later in life, because the themes of dealing with grief might be more meaningful for me then. 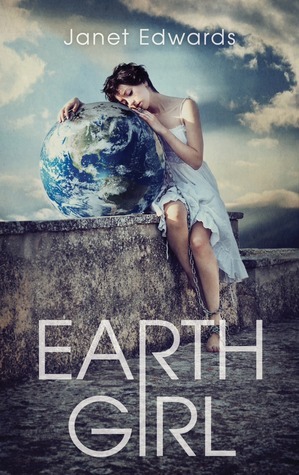 The next Sadie Hawkins Sunday book will be Earth Girlby Janet Edwards. This suggestion comes from Kayla Beck of Bibliophilia, Please, who also gifted me a copy. Thanks lovely! Want to tell me what to read? For more details, check this post. I absolutely adored This Is Not a Test (with a burning passion–love it so so much), and this was going to be my next Summers read, so I’m glad to see you enjoyed it! The mystery aspect sounds really interesting, but I wasn’t sure if it would be so much of a mystery, so I’m really glad to see that the mystery aspect of the novel was your favorite. It’s a shame that you never connected with the MC, but based on what you said about being unable to connect with her because the book was so said, I think I *might* be able to connect with her more. TINAT was the best ever. It’s possible my expectations were too high, based on how amazing that book was. I’m not usually a mystery fan, but this one was pretty freaking cool. I hope you do connect more. That’s such a subjective thing colored by the mood at the time and one’s past experiences! I’ve read two books by Summers and absolutely loved them, so I have no clue why I haven’t read this one yet. This one sounds like something I would love. I’m not so much into the mystery aspect as the other elements of the story, but I can see past that. Eddie sounds like a character I could connect with. I’m totally adding this one to my TBR pile. Hmm, well, the mystery definitely isn’t a typical mystery, but I guess we’ll see when you get there. I need to get onto the remaining two Summers books! This was my first Summers read and by far my favorite (only one I haven’t read is This Is Not a Test). I can understand about not connecting with the characters–I actually had that issues with the MCs of her first two books–but this one was very powerful for me. I thought it was one of the most realistic, unromanticized portrayals of suicide and depression I’ve read. It is a very hard read, though…I read it twice and it was even harder the second time. Not sure I could do it again! TINAT is my favorite, but I’ve only read these two. So. Hmmm, connecting with characters is a very personal experience. I liked how unromanticized it was, but I still feel like the book could have used the slightest bit of leavening. I don’t know. Just one happy moment for juxtaposition. I very much preferred This Is Not a Test to Fall for Anything-I don’t know if it was my inability to connect with Eddie or just not being mentally ready for this book when I read it but FfA was not as good of a read for me as I would have liked. Same for me. Still a great book, but wasn’t what I needed at the time or something. Too bad you didn’t connect with this one a bit more. I still have extremely high hopes for it because I bow down to everything Summers does. I liked what you said about the cold hands, that made me sad. I wonder if I will be able to connect to Eddie, I’m kind of worried about that now. I guess I’ll have to read it soon than later and find out. Fabulous review! Random.org hates me! I have so many books in this thing! Who knows, Jenni. Who knows. You do have books in there. Someday, Jenni. Someday. Why do I keep writing things like that? I’m actually really surprised you hadn’t read this one yet, considering how highly you rated This is Not a Test. I really like what you said about the dumb decisions the MC makes in the romance. Too often the characters make stupid decisions, but they’re portrayed as OK, when obviously they are the furthest thing from it. Ah, yes, well, I’ve been dying to read her others, but haven’t had a chance. My review schedule has been punishing! Yup, I love that she knows her decisions were dumb. It’s realistic for them to make bad choices, but usually you come to that realization along the way. Oh, I really loved this one – I’ve only read this one and “Cracked Up To Be” by Summers, and I actually loathed CUTB, so I’ve been a bit wary about trying her other books. From the sounds of it, I think that, unlike you, I connected with Eddie – not exactly with her situation but with the things that she was thinking and the way that she was reacting. And I think it’s a lot easier to forgive someone their faults when they’re faults that we recognise in ourselves. What did you think of Milo? I kind of adored him, possibly more than he deserved – I mean, he’s pretty supportive, but I did wish he’d told Eddie what happened earlier in the story. Like, way earlier. Hmm, I’ve heard that a lot of people didn’t like Cracked Up to Be, and that makes me very sad. True. Her faults weren’t mine, so it’s harder to see where she’s coming from with everything. Ah yes, Milo. I didn’t want to spoil any of that, so I didn’t mention him in the review. I like him, but, yeah, I didn’t get his motivation for not telling her things, like what he saw and that he wasn’t dating his ex-girlfriend. His behavior was really misleading all around and I don’t know WHY. And when he’s been pretending to date that other girl all summer, I don’t know what right he had to be so jealous. However, I still kind of liked him, because I think his heart was in the right place, even if his behavior wasn’t. I think Some Girls Are is my absolute favorite, then a tie between this one and This Is Not a Test. I liked Cracked Up To Be, but I think her writing gets even stronger in the others. I love depressing books too. This is a new thing I’ve learned about myself, but I like them to have a little bit of humor or hope for juxtaposition. I don’t know. Just like I generally don’t like books that are all happy all of the time, I don’t want them to be one note of sadness either. Some Girls Are is the only one I don’t own! Interesting. She’s just very much not like me as a person, I guess. It’s also one of those cases where she’s not even very much like herself, because she’s been so thrown off by this event. BAHAHA. You should do a tour of your Thinking Deep Thoughts closet for a discussion post. What do you think Christina? Too heavy for a guy like me? Or is this a good insight– one that really may help me understand some things? Depends what things you’re wanting to understand, I suppose. I would probably recommend This Is Not a Test first, but I can’t tell people NOT to read Courtney Summers. That would be a crime. Ever since I read This Is Not A Test, I’ve been really intrigued by Courtney’s writing. I think this book is the one of hers I have in e-book. I remember I snagged one on sale. I loved her writing style in TINAT. This one sounds equally fascinating, and sad in its own way. It’s too bad that you didn’t click with the main character. When that happens for me, I do find that my enjoyment of the book suffers, because I don’t have that emotional connection. It’s just a book I’m reading, instead of a story I’m living. I’ll have to give this one a try at some point! The writing was a little less…poetic in this one. A bit more straightforward, but that’s the characters. I liked TINAT a bit better, but it also took longer for me to adjust to. Yup, a lot of brilliant books get 3.5 or 4 ratings from me just because I wasn’t that extra bit connected. OMG, I absolutely loved this book. It was just amazing. I’ve become a fan of this author and now must read everything she does!! Courtney Summers is a goddess!